RCMP posted dashcam video of the crash at the intersection of Winnipeg's Perimeter Highway and McGillivray Boulevard on social media Tuesday afternoon. A Manitoba motorcyclist is lucky to be alive after a semi-trailer ran a red light and hit him. "I just saw the grille — it looked like it was basically right there all of a sudden. 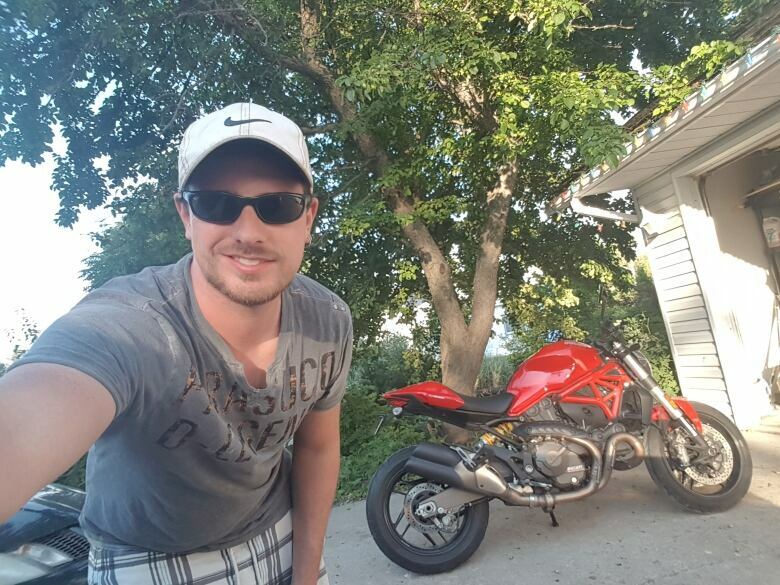 It went from being far away to just being on top of me," said Robert Selby, the motorcyclist involved in the crash. It happened last Tuesday just before 1 p.m. at the intersection of Winnipeg's Perimeter Highway and McGillivray Boulevard. RCMP posted dashcam video of the crash on social media Tuesday afternoon. The 50-year-old truck driver from the United States has been fined $406 for running the red light and for distracted driving. RCMP say witnesses at the scene saw the semi driver on his phone before the crash. Selby says he entered the intersection when the light turned green and saw the semi-trailer approaching but assumed he was stopping. "After the impact, which just felt like, you know, you get hit by a truck, it feels like you're getting hit by a truck," he said. "The first concern was, 'Am I all in one piece?'" Selby was taken to hospital with minor injuries. He suffered bruising to his legs, ribs and arms, as well as a sore neck. "I'm banged up pretty good," he said. "I kinda walked away like I got put in a meat tenderizer." The married father of three from Manitou, Man., said he's thankful he was wearing all of his protective riding gear that day. "In this case it kinda kept my legs from looking like ground beef. I had Kevlar pants on," he said. "They did exactly what they were supposed to — they kept me from losing all my skin basically on the lower part of my body." Selby said his 2015 Ducati Monster is a writeoff. He said he's thankful other motorists stopped to help him, and that two drivers at the scene had dashcam video of the collision. RCMP said they released the video to show the dangers of distracted driving. "We often talk about distracted driving and the potentially fatal consequences, but to actually see how quickly a situation can turn deadly will hopefully help people choose to focus on the road," said RCMP spokesperson Tara Seel in an emailed statement. "Thankfully, there were only minor injuries in this instance, but far too often, high-risk driving behaviours, such as distracted driving, have tragic consequences. We want people to make smart choices: slow down, drive sober, buckle up and focus on the road. We want everyone to get home safely." The driver's employer, Tennessee-based Orgill Inc., said in a statement Wednesday that he has been suspended pending a full investigation. "Orgill has no tolerance for any level of unsafe driving by our more than 360 drivers across North America. Our drivers undergo thorough training before getting behind the wheel of one of our trucks. Distracted driving is certainly a topic covered in training as unacceptable behaviour," the statement said. "We are very happy that the motorcycle driver is safe." Selby said he's extremely thankful to be alive, but thinks the fines for distracted driving should be harsher. "Four hundred dollars seems like ... a very inconsequential fee," he said. The fine for distracted driving in this case was $203, the other $203 was for running a red light. Selby said being on a cellphone while driving is dangerous for anyone, let alone a semi, which can weigh more than 63 tonnes. "Drunk driving, nobody messes around. Well this is just as bad."